Microplastics are small (<5mm) pieces of plastic found in the world’s oceans. They are products of the disposal and breakdown of larger plastic pieces. These small pieces are often consumed by filter feeding marine animals including bivalves and planktivorous (plankton-eating) fish. Baleen whales are very large filter-feeding vertebrates whose prey sizes range from small plankton to small fish. This means that they may consume plastic particles directly as well as through their planktivorous fish prey. Recent studies have suggested this may be the case and that this could be indicated by the presence of phthalates (a chemical in plastics) in whale tissue. Though until now, there has been no concrete evidence of microplastic ingestion by baleen whale species. Larger, mesoplastic pieces (5 to 20mm) have been found in 31 marine mammal species including baleen whales. The list of whale species found containing macroplastic has been growing continuously and now contains 61.5% of whales. Plastic pieces in whales are known to cause starvation and death. Even small pieces of plastic may cause critical obstructions in digestive systems. It is thought that the issue of micro-, meso-, and macro- (>20mm) plastic ingestion may be exacerbated in large filter-feeding whales which typically have less selective capture. Furthermore, plastic pieces may clog the filters necessary for feeding processes. The ratio between microplastic particles and zooplankton in seawater suggests that baleen whales may consume up to 3.7 thousand plastic pieces daily in the Mediterranean (Fossi et al. 2014). This study used a stranded humpback whale in December 2012 to study the microplastic uptake and presence in a baleen whale. Figure 1. 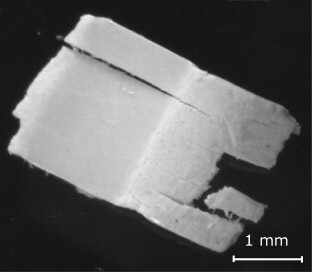 Plastic particle of synthetic origin found in the gastrointestinal samples (Fig. 1, Besseling et al. 2015). The scientists found Johanna to be in overall good physical health in terms of her musculature and blubber thickness. Some post-mortem decomposition prevented good assessment of the internal organs. Continued digestion during the four day stranding may have reduced the gastrointestinal contents as little was found. 45 pieces of plastic were found in the samples – 77.7% of those were large enough (>1mm2) to be analyzed. Of those, 45.7% had synthetic origin, 25.7% had a natural origin, and 28.6% had no matching category the analyses. Synthetic polymers are produced from petroleum oil while natural polymers are typically water-based. Examples of natural polymers are silk, wool, cellulose and proteins. The shells of certain marine fauna may be considered natural plastic. For details on the composition of the synthetic particles, refer to table 1 above. The number of particles was considered less important than the total volume because pieces may be broken up in the gastrointestinal tract. The total volume of plastic was 13.7mm3. Of that, most were composed of polyethylene, the most widely produced plastic and the polymers using in fishing gear. The sampled humpback, Johanna (R.I.P. ), was estimated to have a gastrointestinal length of about 57 meters. Projecting the amount of plastics found in one fifth of that length, the authors estimate that Johanna contained a volume of about 137 mm3 of plastic. The authors then estimated the concentration of plastic particles in the marine environment by calculating the daily water filtering rate and gut passage times of a humpback of Johanna’s size. Their measurements were fairly congruent with real measured concentrations in seawater. This suggests that the plastic found in the humpback’s gut was likely due to filtering seawater for prey. Humpbacks are known to be lunge feeders (check out another Ocean Bites article on Antarctic lunge-feeders here). Thus, they tend to target aggregations of their preferred prey items. It is possible that the concentration of plastics found in the humpback whale are lower than those that would be found in less selective baleen whales. I am studying for my doctoral degree at the Stony Brook University School of Marine and Atmospheric Sciences. My research addresses fisheries and climate change in the Northwest Atlantic. In my free time, I like to cook and spend time outdoors, sometimes at the same time.